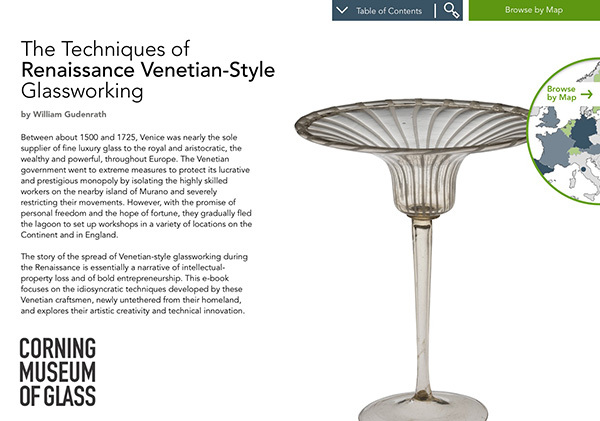 The Techniques of Renaissance Venetian Glassworking is an investigation of the probable working practices of some of the most skilled artisans of all time: the glassblowers of Renaissance Venice. To my knowledge, this topic has never before been explored in a thorough and systematic way. The medium is an entirely paperless, digital construction that combines a rather large quantity of high-definition video (with narration and captions), many still and 360-degree images (with links to more), and a modest amount of prose. Our purpose here is to better understand and appreciate glass objects made on Murano, Venice’s historic glassmaking island, between about 1500 and 1700. During this period, which is often referred to as “the golden age of Venetian glass,” Venetian glasshouses enjoyed a pan-European monopoly in supplying luxury glass to royalty, aristocracy, and other wealthy and powerful individuals. As can be seen in the final section of this publication, however, the scope of the work extends considerably beyond 1700. Following a gradual decline in prestige and quality during the late 18th century, the Venetian glass industry all but disappeared in the early 1800s. We will examine the discontinuity in manufacturing methods and working practices between the earlier and later years by closely comparing objects made during both periods. We have made every attempt to create a welcoming and user-friendly publication, so that if a visually arresting video of intricate glassblowing grabs someone’s attention, further investigation can be easily undertaken. Here, at the outset, it is fair to consider this question: For whom is this utterly arcane information intended? Stated more boldly, who cares? Actually, we envision a highly varied audience. There is no question that the primary target is the specialist in the decorative arts and, more particularly, glass. That rare breed of specialists who focus on European glass will be right at home here, although museum personnel, such as conservators and preparators, may well appreciate an in-depth, behind-the-scenes look at these objects and their genesis. Collectors and dealers of Renaissance Venetian glass will also find much of interest here. A collector’s familiarity with glassworking processes may not extend beyond an occasional visit to Murano. The speed and virtuosity required for the making of these “fragile beauties” (as Felix Slade, the great 19th-century English antiquary, called his encyclopedic collection) may well come as a surprise. For many, the final section of this publication offers an important practical application: helping to develop a systematic way of determining whether an object dates from, say, the 17th or late 19th century (or later). Two additional categories of readers will likely find this publication useful: glass artists and members of the general public. Many contemporary glass artists study Venetian glassblowing methods with the sole aim of developing and refining their skills. Often, aesthetically speaking, their own creations bear no relation to Venetian glass of any period. Nevertheless, for technique building, there is no quicker route to the mastery of molten glass. I hope that the many videos contained herein will prove to be beneficial as study aids for colleagues and students. As for the general reader, who may have had no previous interest in glass, it is not inconceivable that alert and curious people, while strolling through cyberspace, might happen upon one or more of the 45 or so technique videos, somehow untethered from the Corning Museum of Glass Web site. In that event, the credits at the end of each video should make it clear that the video the viewer has just watched is part of a larger structure—this digital resource. With that thought, we have made every attempt to create a welcoming and user-friendly publication, so that if a visually arresting video of intricate glassblowing grabs someone’s attention, further investigation can be easily undertaken. After all, winning friends for Venetian glass—and for The Corning Museum of Glass—is very much a goal of this project. First, an original object and some of its close parallels were attentively studied. This required a hands-on inspection that always included measuring (later, also weighing) an object and carefully noting all of the details that might shed light on how it was made. This work was carried out with the close—and always enthusiastic—participation of colleagues who, questions of technique aside, invariably knew vastly more about these objects than I did. A number of important collections of Venetian glass were made available. Initially, they included The British Museum (with Hugh Tait), the Wallace Collection (with Suzanne Higgott), The Corning Museum of Glass (with Dwight Lanmon and David Whitehouse), and The Metropolitan Museum of Art (the Lehman Collection, with Dwight Lanmon). Later, more assistance was provided by the Victoria and Albert Museum (with Reino Leifkes) and other colleagues at The Corning Museum of Glass (chiefly curators Jutta-Annette Page and Dedo von Kerssenbrock-Krosigk). More recently, Keith King, Sylvie Lhermite-King, Kitty Lameris, and Erwin Baumgartner made available various private collections and offered helpful insights. Next, I conducted experiments at the glassblowing furnace, often pursuing many possibilities. Processes that closely imitated telling features noted in the original objects were explored, and those that did not were discarded. Eventually, efficient and complete processes emerged. Finally, the experimental results were carefully compared with the original objects. The experiments and the resulting processes were deemed successful when the two matched well. Concerning the authenticity of the videos, I believe that the action taking place at the ends of the tools—blowpipes, punties, and hand tools—is very similar to what one might have seen in a Venetian glasshouse of about 1500–1700. Admittedly, however, the similarity ends just about there. The Renaissance counterpart of the methane/forced-air furnace seen in the videos would have been wood-fired. In place of the glassblowing bench, workers would have been seated on a stool at the working hole of the furnace, and they would have rolled the blowpipe back and forth on boards strapped to the upper part of their thighs. Also, while the videos show me working entirely solo, we know from period illustrations that Renaissance glassblowers worked in small teams. Thus, the idiosyncratic choreography that I have developed for working solo would have been quite foreign to a Renaissance Venetian artisan. Despite these differences, much of the work in the immediate vicinity of the object, as shown in the videos, would probably look very familiar to a hypothetical viewer from the distant past.